Oh my goodness! Fall and Halloween season are here! 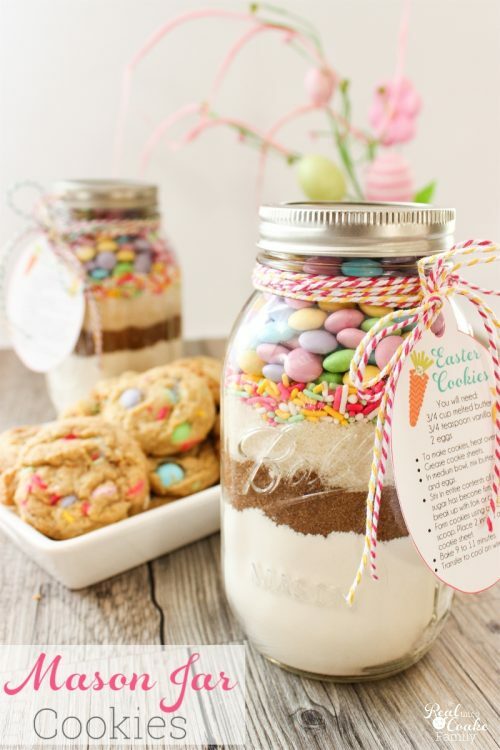 There are so many fun crafts for the home for the rest of the year! It is always a fun crafty time of year. However, being a busy mom, just like you, I've had to find simple quick crafts that I can add to our home decor because I don't have time for more elaborate crafts these days. 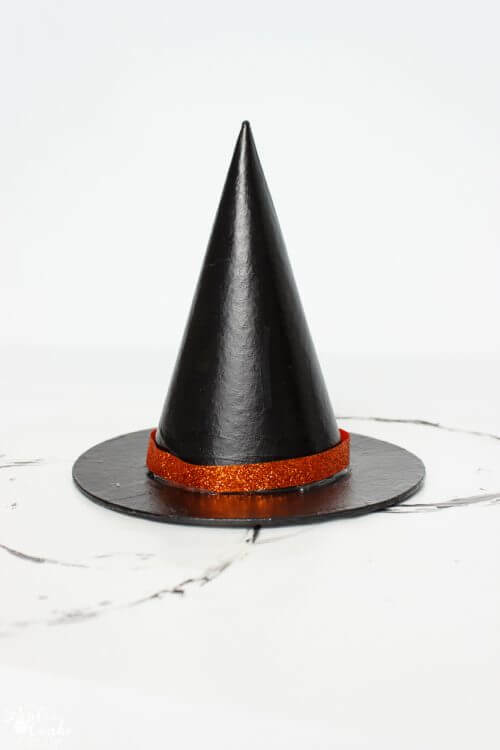 Today, I'm sharing a super easy Halloween craft you can add to your Halloween decor this year. I needed a little bit of a change up for my Halloween mantle this year. While I love the little ghosts I made, I get bored easily, so I was wandering Michael's looking for something new. 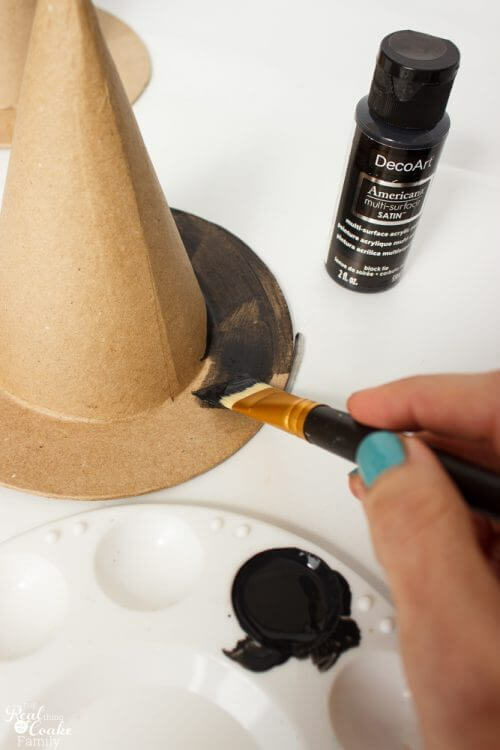 I saw these paper mache hats and knew I could quickly and easily make a cute something for the mantle with them. 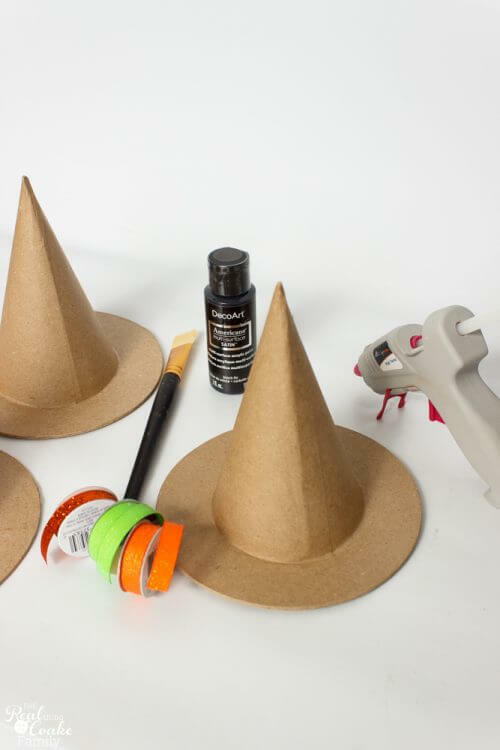 Let me show you how to make this easy Halloween craft. 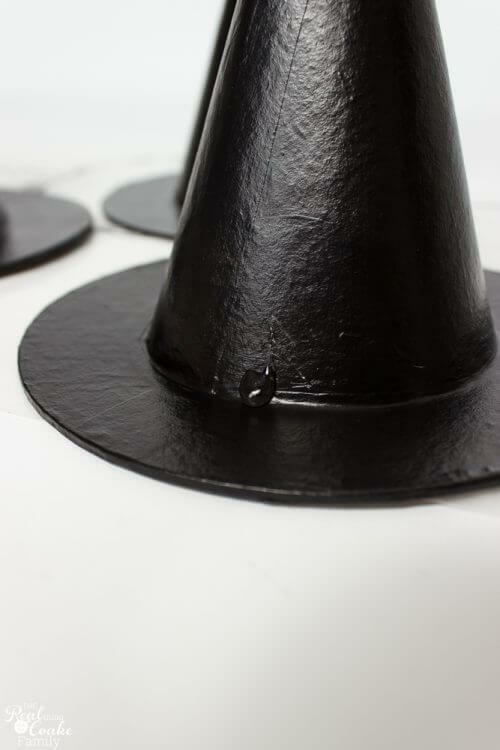 Start by painting your hats with the black paint. If you want solid coverage, you will need at least 3 coats. If your time is limited, you can paint one coat each weeknight until the 3 coats are completed. Depending on the climate where you live, if you use the same paint I did, you may be able to recoat in 30 minutes. I was able to recoat in 30 minutes as it wasn't very humid the day I made these. You just need to wait until the paint isn't tacky anymore, then you can recoat. After your final coat, allow the paint to dry completely. 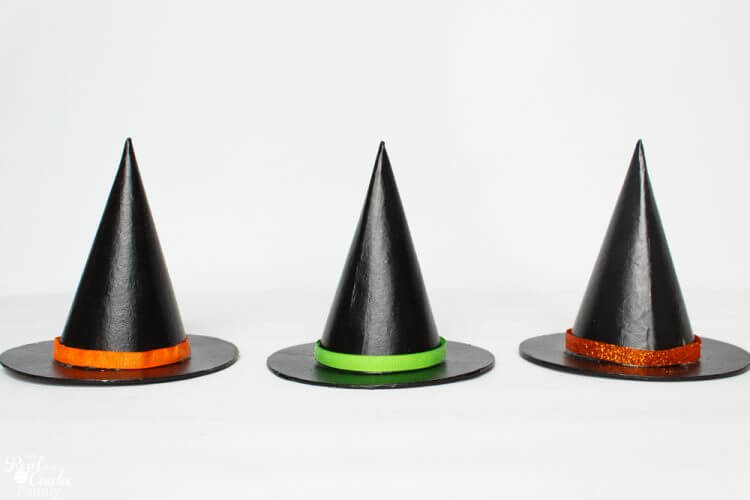 Next, you want to attach your ribbon to your hat to add a little color and fun to the witch hats. I tried several different methods to attach the ribbon. It is that dilemma of round hat meets straight ribbon. The ribbon has a tendency to pucker up versus lay flat. In the end, I preferred the method where I just put a dab of hot glue and added the ribbon. 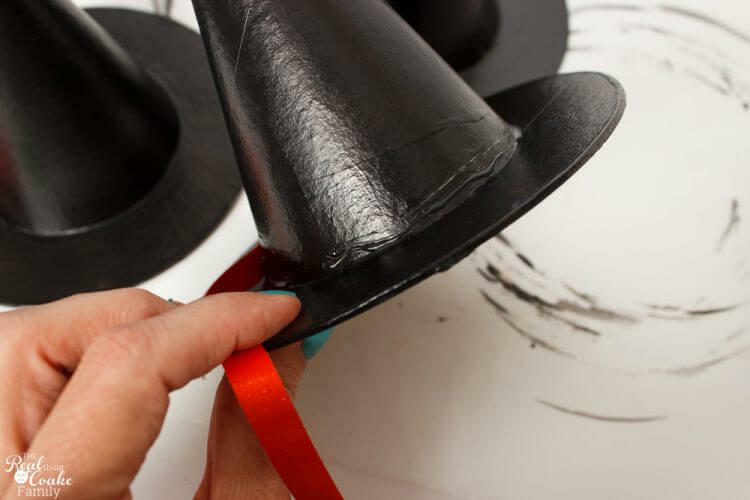 Then I only added another dab of hot glue in the same spot and wound the ribbon around the hat and attached it in that spot. So only 2 dabs of hot glue were used both in the same spot for the start and the end of the ribbon. When I added glue along the bottom all the way around the ribbon just puckered up. It doesn't look bad, but it doesn't look as smooth as I would prefer. This is one of the hats with the glue in lines around the bottom. Cute! I just don't like the slight puckers in the ribbon. Looking at these three hats, the one in the middle is the one with only 2 dabs of hot blue. The ribbon is smooth, which I prefer. 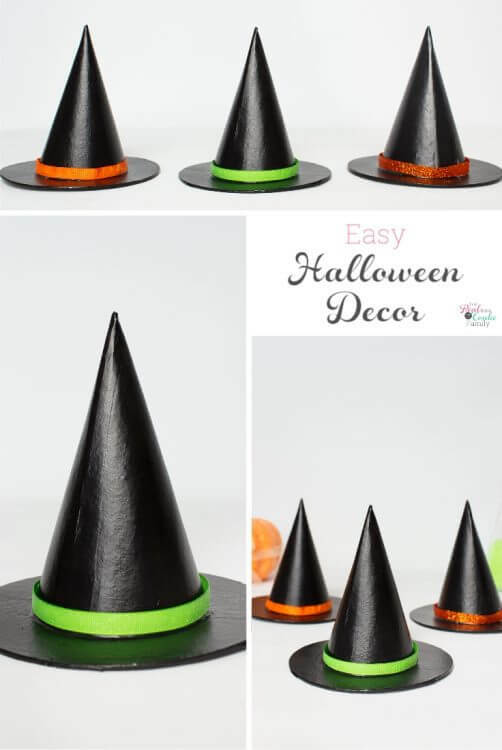 I told you this was an easy Halloween craft! That is it, you are done. 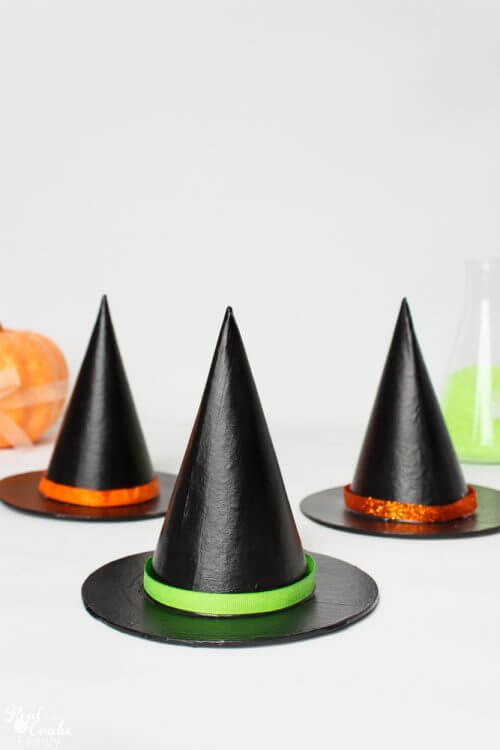 I kept them really simple because I'm going to be using these hats with some science Halloween type decorations (I'll show you those soon) on my mantle. Together with the Halloween pumpkins I have, it comes together really nicely and I don't need more details on the hats.